The April 25earthquake has damaged most of the school buildings in districts outside Kathmandu Valley. The government plans to reopen schools in the quake-hit districts from May 15, but without safe place for the students to learn, the possibility of these schools reopening is highly unlikely. Most of the school buildings in Chitwan district have been damaged. As a result, the District Education Office (DEO) said, studies of thousands of students have been affected. In Makwanpur, the earthquake destroyed 11 school buildings and caused damage in many as 162 schools . There are a total of 520 government schools in the district. Similarly, 97 percent schools in Nawalparasi have been damaged. In Dolakha district, nearly 90 percent of the schools have been damaged by the Great Quake, according to the initial report of the District Education Office. Similar is the situation of the schools in Sindhupalchok and Gorkha districts. In Sindhupalchok, almost all school buildings in the northern region, including Golche, Gumba, Pangtang, Hagam, Baruwa, Baskharka, Bhotang, Gunsa, Helambu have been damaged or destroyed. 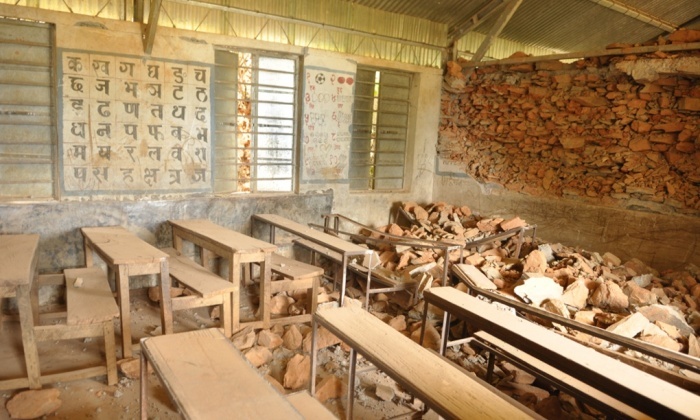 According to the preliminary assessment, 2,000 out of 2,347 classrooms in the district have been destroyed while the others have been deemed unsafe.Similarly in Gorkha, 3,052 out of 4,600 classrooms have been destroyed.